Ok, here it is, the post you’ve all been waiting for! So yeah, as many of you know I’ve been playing “Klingon Music” for some time now (about mid 2009). It’s basically a side project of my difficult to categorize group, il Troubadore. We’ve simply named it the “il Troubadore Klingon Music Project” for lack of a better name (or rather, at risk of re-naming the group for the Klingon Music project, thus drawing away focus from “il Troubadore” as the group). If you prefer, you may just refer to us by our “Klingon name” of bomwI’pu’ (which almost literally translates into English as the “Songmakers”). So, for a number of years (well before il Troubadore was formed) I’d been a member of the yahoo group, the “Klingon Music Guild” and had on occasion research [what little] Klingon music existed since. Sure, I’d come across ter’eS page (if you haven’t listened to his lurDech–DO IT–better yet, watch the video below–absolutely genius!!) 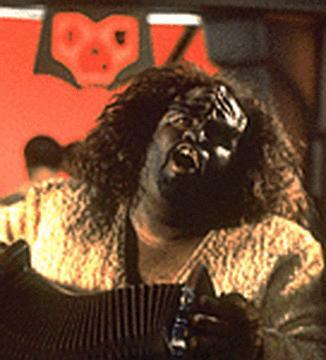 as well as many websites with Klingon Karaoke lyrics, but rarely anything specifically about, well, Klingon Music. And by that I mean music that would function as music that Klingons would have written. Sure, once Youtube started the video self-publishing revolution, it became easy to find clips of Klingon songs and Klingon Opera from the various Star Trek series and movies. And now Klingon related material abounds (do a search for Klingon Music on youtube–you’ll see) but still almost none of it is music developed in the style that Klingons would write. Even the examples from the series leaves a little bit to be desired and I often wonder if this was part of the motivation for the current production of the Klingon Opera ‘u’ in the Netherlands. It’s about time I started blogging about Klingon Music, so all that aside, here are some tidbits from Marc Okrand’s (the creator of the Klingon Language), Klingon for the Galactic Traveler, in the chapter titled simply “Music” (and some of this info can be easily found online). Ok, fair and straightforward enough, right? Actually there are a number of cultures whose art music still follow this kind of strict regime (though that’s starting to change now). In many parts of Asia the musical training and other performing arts training as well as martial arts training all evolved in similar ways. In fact, many dance-drama traditions in Asia still have a heavy martial arts component to the training: Kathakali in Kerala, Khon in Thailand, Jingju in China. And some martial arts traditions are intimately tied to music: Southeast Asian kickboxing; Brazilian Capoeira. The next paragraph is something that tends to get Westerners, or at least folks who aren’t familiar with musical styles and genres outside of the Western World. Ok, now things are getting a bit more interesting. I’m going to assume that Okrand, by “nonatonic scale,” means a nonatonic scale within an octave (which is misleading as it presupposes an eight note scale in the first place–maybe we should refer to it as a nonave?) distance since the starting pitch name and the ending pitch name are the same (implying both pitches are the same separated by an octave/nonave). A typical Western scale would have eight tones that are usually some combination of major seconds and minor seconds (sometimes misleadingly referred to as “whole tones” and “half tones” respectively). In the Klingon scale I’m going to assume Okrand is referring to an equal tempered scale rather than some odd combination of major and minor seconds within an octave. Given an equal tempered scale of nine tones, we’re left with a whole mess of pitch intervals that don’t appear in Western scales. Which is not to big a deal, really, since I’m intentionally highlighting as the point of reference a Western scale, you folks can correctly guess that there are non-Western scales out there. In fact, there are plenty of them (quite literally thousands) but I’m only going to mention one class of them found predominantly in the Middle East. This is primarily because there are music intervals within those maqamat/makamlar/modes that come pretty close to sounding like what a Klingon nonatonic scale interval would presumably sounds like–namely, a three quarter tone [interval] or neutral second (technically the interval is very close to a just minor second otherwise know as a semitone maximus). Since this is a book from the future talking about the history of the past which has not yet happened in our time, I’m wondering how much Okrand is “presaging” a future co-dominance of Chinese as well as American (i.e. Western) culture in referencing musical theoretic notions that are obviously Western (the solfège “do, re, mi” system Okrand mentions) as well as a numeric notation system which is what the Chinese use for their traditional music (i.e. jiǎnpǔ). But this is the Star Trek universe and not the Firefly universe and more than likely it’s an unintentional Western-centric musical bias, which is fine. Marc Okrand is a linguist, not a musicologist (much less ethnomusicologist), afterall. Also of interest, I was at the Louisville Science Center singing Klingon Songs outside and posing for photos everywhere this past Saturday (May 21). Tracy Canfield of Alien Tongues and Michael Roney, Jr. (aka naHQun) were inside giving talks about the Klingon Language during the final weekend of Star Trek: The Exhibition. It was a grand time and much honor was won!